LOS ANGELES, CA – The first event of the new UCLA Niarchos Center for Hellenic Culture incollaboration with the Hellenic University Club was a lecture about author Tasoula Hadjitofi’s book From Refugee to Icon Hunter: A refugee’s quest to Reclaim Her Nation’s Stolen Heritage.Hadjitofi’s journey started when the Turkish troops invade the island of Cyprus in 1974 that forced her and thousands of other Greek Cypriots out of their hometown of Famagusta. As a refugee who was unable to return to her city, a city that still remains deserted, she pursued a business education in England. She then became a successful entrepreneur by founding Octagon Professionals International, a company specializing in the provision of IT services to clients in Europe and Asia. While she was very busy with her company’s activities she did not stop advocating for her beloved island of Cyprus. Her tireless efforts earned her the name “Voice of Cyprus” and soon she got the attention of the Cypriot government who appointed her to be the Honorary Consul to Cyprus in her adopted country of Holland. She became the first woman and the youngest person at the age of 27 to be appointed to the position. That prestigious appointment took an unexpected turn when she was introduced to the shady world of art trafficking. Soon after her appointment, she was approached by Michel van Rijn, an art dealer who was offering information about stolen Cypriot religious icons from the churches of the Turkish-occupied part of Cyprus in exchange for payment. And the collaboration produced results. In the early 1980s, with the assistance of the Bavarian police, they set up one of the largest sting operations of art trafficking known as the “Munich Case” that resulted in the confiscation of over $60 million worth of stolen artifacts from the churches of Cyprus and the arrest of the Turkish art smuggler Aydin Dikmen, who was partners with Michel van Rijn. Because of Hadkitofi’s relentless pursue to repatriate the stolen icons back to Cyprus, she earned the name“Icon Hunter,” a title she continues to honor 30 years later. “They took my youth and my home and I was not going to let them take away my identity and cultural heritage.That motivated me to fight back,” she told TNH. The traveling and long hours away from her family were not the only personal sacrifices she suffered. 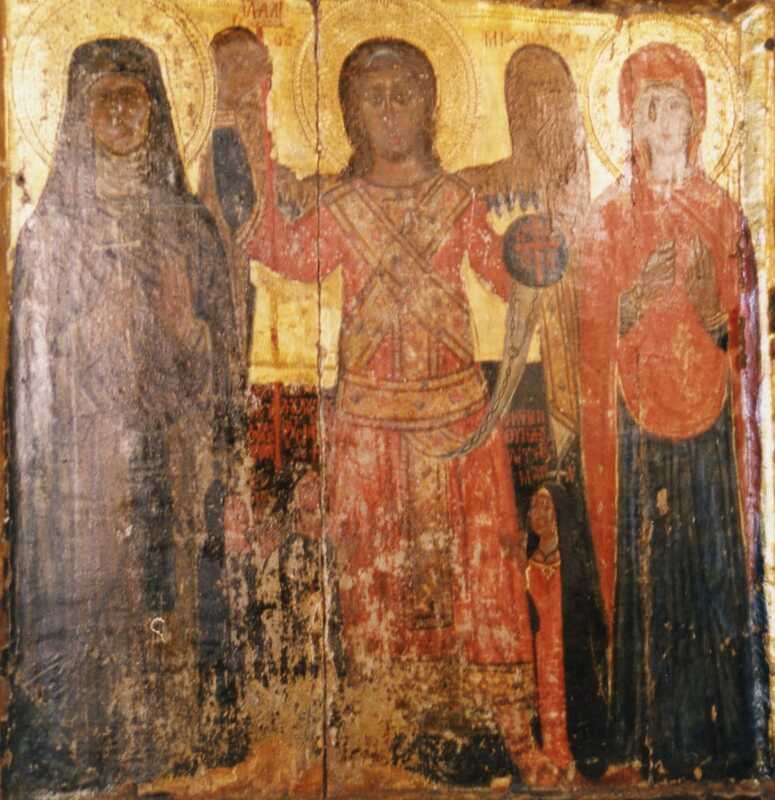 “I paid for all the monetary expenses out of my pocket except for the legal fees that were paid by then Archbishop Chrysostomos, who had entrusted me with the task of repatriating the icons” Hadjitofi said. Her book that has been described by critics as inspiring and empowering came out of Hadjitofi’s desire to “tell the pain of all the Cypriots through my personal story, a journey for justice that has lasted more than 30 years’’ she said. The lecture was a huge success. Over 300 people attended and many of them were UCLA undergraduate students who were touched by Hadjitofi’s emotional account of events. UCLA Professor and Acting Director of the UCLA Niarchos Center Sharon Gerstel in talking toTNH about the event said that “as a Byzantinist familiar with Tasoula Hadjitofi’s work, I immediately agreed to sponsor the lecture and we were thrilled to partner with the Hellenic University Club, an organization dedicated to promoting the study and understanding of the Hellenic Culture. Our collaboration was enormously helped by Andreas Kyprianides, Honorary Consul General of Cyprus who worked tirelessly to promote the event.”All proceeds from the book will benefit the nonprofit organization Hadjitofi created “Walk of Truth.” The mission of the organization is to combat art trafficking by initiating reforms to protect cultural heritage worldwide. The latest initiative she established, the Cultural Crime Watchers Worldwide(CCWW) empowers people to leave anonymous tips in order to avoid destruction and looting of cultural monuments especially in conflict areas. “We raise awareness of the importance of cultural heritage through lectures, debates, workshops and by initiating legislative reforms. We have been approached by concerned citizens from Iraq, Syria, Mali, and Afghanistan, just to name a few, who want to protect their cultural heritage. I offer my knowledge, experience and network to avoid cultural crimes” Hadjitofi told TNH. Part of raising awareness about the continuing Turkish military occupation in Cyprus is the walk Hadjitofi is organizing on August 14 in Cyprus, details of which can be found on her website, tasoulahadjitofi.com. The Hadjitofi lecture was only the beginning for the UCLA Niarchos Center for the Study of Hellenic Culture, which was created thanks to a $5 million grant from the Stavros Niarchos Foundation (SNF). “We are pleased to announce that the President of the Acropolis Museum Demetrios Pandermalis will give a lecture at UCLA’s Hammer Museum and the event is free and open to the public. The Center has completed nearly one-third of its matching grant to the Niarchos Foundation,” Gerstel told TNH. The topic of the lecture is, The Acropolis Museum: Achievements and Future Plans and will take place on April 22.